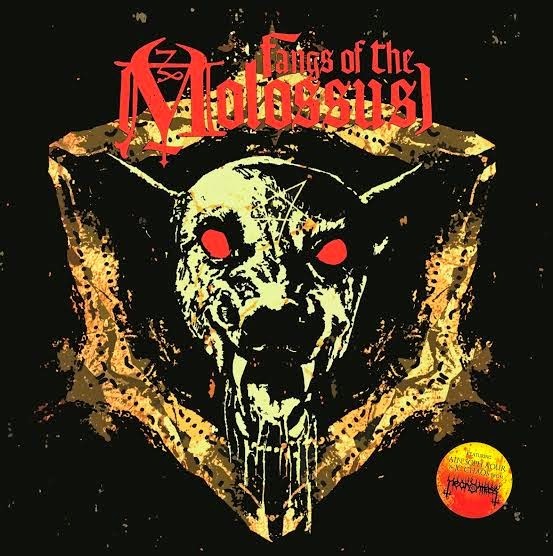 While the self-titled Fangs of the Molossus album came out on CD back in 2013, it's getting a new breath of life thanks to a vinyl re-release from Italian Doom Metal Records. This will be their first release promoting the Italian doom metal scene exclusively, and with the wide spectrum of those bands, this is a stellar starting point for the indie label. The music itself is an exercise in occult doom metal with a heavy handed dose of psych and stoner at times. The third track "I Drink Your Blood" was an immediate attention grabber the first time through. This is a song Sleep would of written if they were watching nothing but 70's Italian horror flicks while getting stoned and recording "Sleep's Holy Mountain". The same use of massive, pounding riffs with an even darker and more sinister edge to them. With the bass and drums just as heavy as anything you've heard, the song slams through until the halfway point where it's broken up by an instrumental section with a hammering textbook doom riff that gives way to a spaced out guitar solo. By the last couple minutes things get reeled back in from the psychedelic freak out session and return to the opening riff that the track rides into the darkness on. With four more tracks of visceral doom metal gracing the LP, it's worth forty solid minutes of heaviness front and back. You can go snag a copy of the new black or blood red vinyl, or even a hand numbered promo edition, from Italian Doom Metal Records.